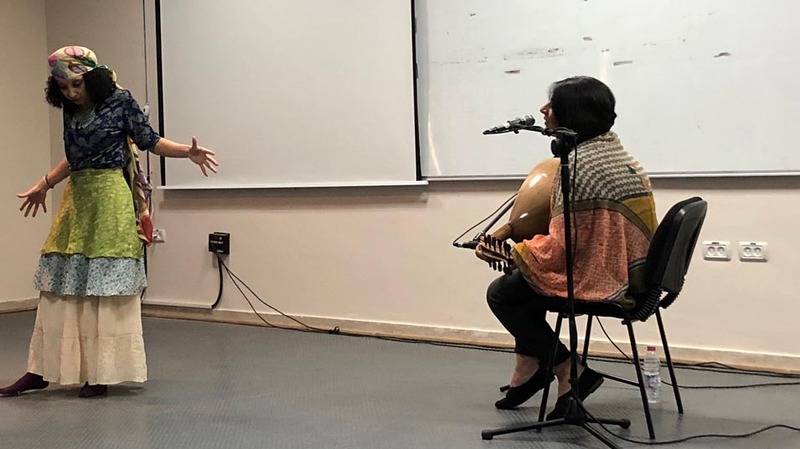 As part of the daytime activities of the Birzeit Night Festival, the Deanship of Student Affairs at Birzeit University hosted “The Roses in Between” storytelling show, led by Hanin Tarabay, a therapeutic groups facilitator who utilizes storytelling and social theater – through playback and theater of the oppressed – and Mira Azar, a musician, on Monday, July 31,2018. Tarabay, utilizing a few stage props, was able to whisk the attending students to a world where people of Venus and Mars settle their communication differences on Earth, ogres fall in love with humans, and the sky rains because of a mother’s sadness over her lost daughter. Captivating as they were, the stories drew listeners even more closely because of Tarabay's interactive style, by which she incorporates audience members’ ideas and conceptions of right and wrong into the fabrics of her stories. The stories grew more enchanting with Azar’s hymns and oud performances, perfectly in sync with Tarabay's storytelling pace. Birzeit Nights is an annual festival that celebrates Palestinian heritage, folklore, and culture. Hosted by Birzeit University and organized by its Deanship of Student Affairs, the proceeds of the festival go toward the Birzeit University Student Fund, which supports students in financial need to continue their academic journeys.